Shuffle-tracking is a mathematics-based approach, just like card counting. Casino shuffle tracking is one of the techniques that are being used by Blackjack players. It is an offshoot of card counting, but it is more difficult to learn. 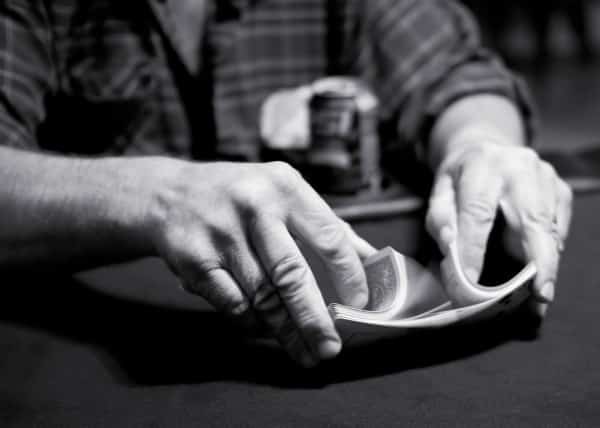 To understand shuffle tracking you need to understand card counting first. Shuffle tracking is about tracking certain cards or sequences of cards through a series of shuffles. Shuffle tracking is typically done in Blackjack, but it is possible to use it playing other card games as well. Shuffle tracking is feared by casinos. While casinos have become very adept at identifying card countering, shuffle tracking is much harder to spot. 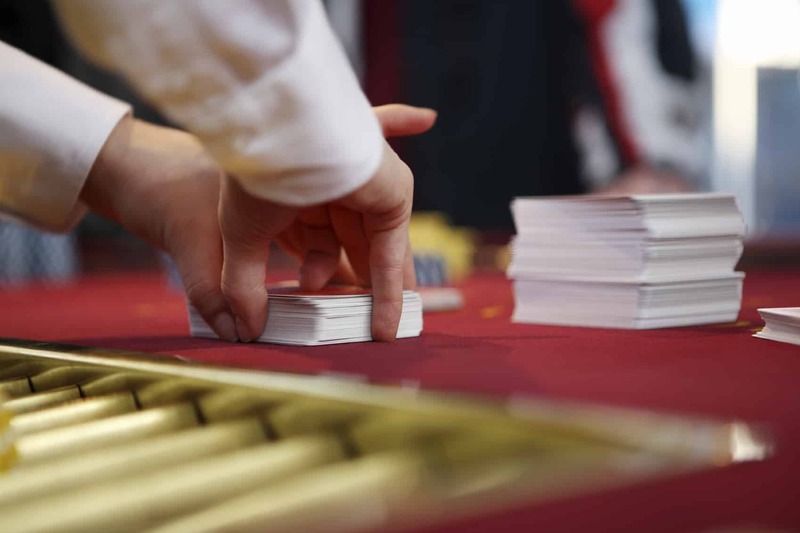 The technique involves tracking clumps of tens and face cards and monitoring them in the next round of shuffles. The prominence of cards with a value of ten increases the possibility of the dealer getting busted, and thus gives the player advantage. Advantage gamblers will then increase their bets once the bunch of tens emerges from the shoe. However, continuous card shuffling machines (pictured below) have become very widespread. 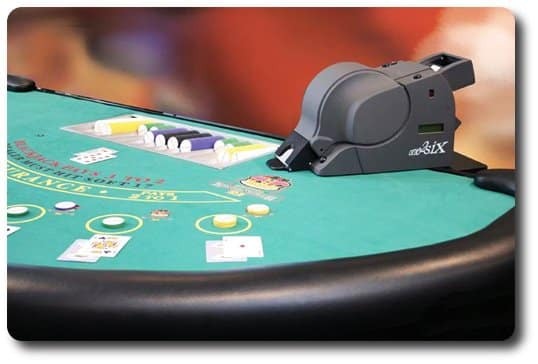 CSM machines make card counting and shuffle tracking impossible. Many shuffle tracking strategies exist. Generally, the player, or a team member keeps track of the count (high cards vs. low cards) of one or more subsections of the cards as they are played. The selected sections may or may not be predetermined by observing and mapping the shuffle. These sections are referred to as “tracking zones”. The player may attempt to follow slugs of cards through the shuffle, or have a good idea of the final location by previously analysing the shuffle. After the shuffle, play zones exist which contain most of the cards in the tracking zone as well as other cards. The player can then cut zones with high cards into play, or with low cards out of play, thus changing the normal composition of the shoe. Betting can then be altered to reflect the altered composition. knowing card counting is a prerequisite. Shuffle tracking is the practice of keeping track of cards as they are being shuffled. The premise of shuffle-tracking is that shuffles are not random – the location of cards after the shuffle is to some degree predictable. Counting is necessary to have some idea of the favourability of different regions of the played cards, so that these regions may be tracked through the shuffle. A common shuffle used by casinos is the “zone shuffle”. Here, the cards are broken into piles, and then the shuffling is only performed between the piles. Thus, even with the uncertainty in pick sizes and riffs, a particular card has a zero percent probability of being in certain portions (most of) the shuffled pile, and a high probability of being in one or two particular portions of the shuffled pile. Shuffle-trackers actively exploit the inherent non-randomness in casino shuffles. The technique involves keeping track of the count in different portions of the discarded cards, as they are observed during play. However, the tracking explanations will hold for just about any counting system. Almost all counts assign low/negative values to high cards (such as 10’s are valued as -1) and high/positive values to low cards (such as 6’s are valued as +1). It is a fact that high cards favour a player and low cards favour the dealer. Hence, removing a high card from the shoe reduces the running count and removing a low card from the shoe increases the running count. The higher the running count, the more favorable (or less unfavorable) the game is for the player. True count is running count divided by the number of unplayed decks, and for the high-low system each unit of true count is worth 0.5% advantage. As an example of a simple tracking method, if the end-of-shoe count is -10, then you know that the count of the unplayed cards is +10. If the unplayed cards all get shuffled into the top half of the shuffled pile, where should you cut the cards? The answer is right in the middle. The reason is that the unplayed cards had a count of +10 – that means there were 10 more low cards than high cards – you don’t want to play those low cards which are now in the top of the pile, so you cut in the middle to put at least some of them out of play during the next shoe. You might also want to pat yourself on the back and raise your betting during the first half of the shoe, even though the count will probably start to go negative. The reason is that on average, the first half of the shoe should now have a count of -10, which means there are ten more high cards than low cards. An important thing to remember during shuffle-tracking is that high count regions are bad and low count regions are good. This can be counter-intuitive. Ace sequencing is about attempting to determine when an ace is about to be dealt. If a player knows that he will be dealt an ace as his first card, he gains a 50.43% advantage. This is because a player has about a 31% (depending on number of decks) chance of getting a Blackjack, or a good chance of making a strong hand if he is not dealt a Blackjack. First the player needs know what segments of the discards are likely to appear relatively intact after a shuffle. Then, the player observes aces as they are placed into the discard tray within a segment. Then, the player remembers the two or three cards placed on top of the ace in the tray. These are called key cards. After the shuffle, the player looks for the key cards. The ace is likely to follow these cards and the player may be able to raise his bet in anticipation of receiving the ace. The previous section gave a trivial example of shuffle-tracking, where you just use the running count at the end of the shoe. Tracking more regions can give you more detailed information about the next shoe. Suppose it is a four deck game, with three decks actually dealt. You record the running count for the first deck and call it A, the second B, and the third C (the recorded running count is for each deck individually, so you must either take differences in the new and previous running counts). The unplayed deck is D, and it is assigned the opposite of the final running count. The profile shows how the tracking units are combined. The plus sign indicates that the estimated count in each two deck region is simply the sum of two tracking units. Here, you would cut as close to the bottom, trying to keep the -3 in front of the end-of-play card. You would bet more aggressively in the -3 region and more conservatively elsewhere. Use your casino chips to track! The outcome of any shuffle tracking scheme is largely dependent on he individual abilities of the player as well as his knowledge and analysis of the shuffling style of the dealer he’ll be playing against. Therefore, no uniform shuffle tracking exists – it has to be tailored to the situation each and every time. The videos below are not exactly tutorials, they only explain and showcase how powerful shuffle tracking can be in practice – if done correctly. If you read the tutorial and watched the video tutorials you only need to practice to master shuffle tracking. If you are new to shuffle tracking, or you are just starting to get the hang of it, you need to practice in an environment that has less distractions than a brick & mortar casino. The best place to practice shuffle tracking is a so called “live casino” (online casino with live dealers). A live dealer casino is the perfect place to practice, because you can have a tutorial open while you play. If you are not an experienced advantage gambler, your behavior would draw suspicion from the dealer in a casino but in a live dealer online casino nobody will notice. If you are looking for places to practice shuffle tracking, check out these live dealer casinos. BGO offers live dealer games, here you can experiment with shuffle tracking! 32 Red online casino offering live dealers – you can try ace sequencing here, if you feel up for it! CSM (Continuous Shuffling Machines) make shuffle tracking impossible (live casinos have CSM sometimes too). Remember, shuffle tracking is not illegal but you can get banned from a casino (or online casino). The higher the count, the more you should bet,but keep in mind that if you range your bets too much, you might draw some heat from the casino. Subtlety is important. The theory of shuffle tracking has not been substantiated as card counting has, so even if there are more or less working methods out there, there is no uniform technique that would yield the same results every time. The outcome of shuffle tracking schemes depend largely on the abilities of the player and the extent to which he is familiar with the shuffling style of the dealer he’s playing against. Everything you need to know about shuffle tracking: tutorial, guide, strategy, videos and more. In-depth guide to shuffle tracking. Hello, excuse me, I need your help, do you know wich online casinos USE CSM at their live blackjack?